Running a pet daycare and boarding business can be tough work. One of the hardest aspects can be keeping track of all your pets' vaccine records. Is Fido's rabies vaccine about to expire? If so, he can't be part of the pack. What about Dexter's DPP vaccine? The list goes on! 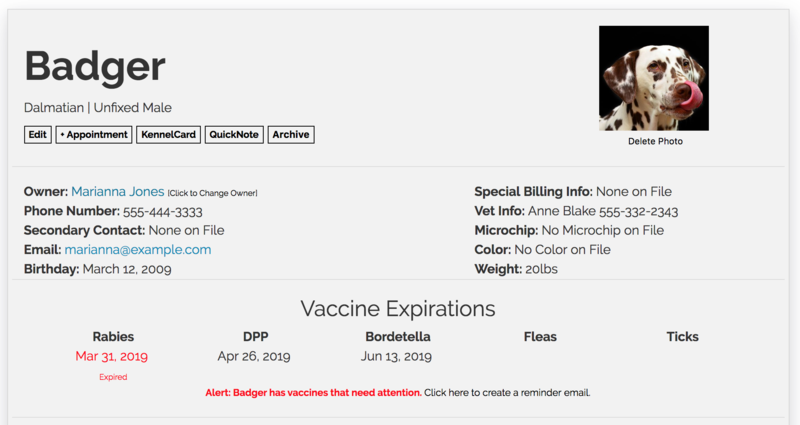 By far, one of the most popular features of DoggieDashboard is the expired vaccine notification system. You're able to keep track of all your pet vaccines in one place. You can even set the "notification window" to notify you if your pets have vaccines expiring in two weeks, one month or two months. Using the "Vaccine Reminder Emails" feature, you can even send out customized emails to pet owners to let them know that you need to get new vaccine information on file. If you're the owner of a pet-service business and need a way to keep track of your pet vaccines, give DoggieDashboard a try. It's free for the first 20 clients and pets, so you can get a feel for the software before deciding if you want to upgrade to the Premium version which offers unlimited pet and owner storage. Are you looking for dog daycare & kennel management software? DoggieDashboard is free for your first 20 clients. Try it today! Need tips for running your business? Check out these popular posts. Getting new customers for your doggie daycare is hard work. Here are some tips to start getting more clients in your doors. If you're a dog daycare looking to increase your social media presence, here are four simple tips to get started. Facebook's new post scheduling tool is great for planning future promotional posts for your doggie daycare. Here's how to use it. Any advice you'd like to give fellow pet businesses? If so, please leave it in the comments below.